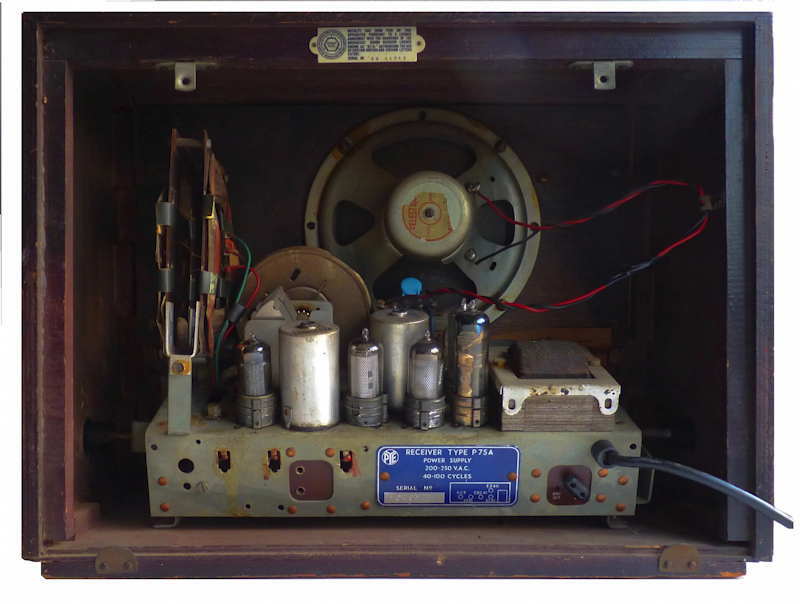 Pye model P75A AC mains operated table radio with Long and Medium and Short wavebands (1100-2000, 187-567, and 16.3-51.8metres) housed in a veneered wooden cabinet. Valve line up: ECH42, EF41, EBC41, EL41 and EZ41. Now working well. First released in 1954. When I was given this radio by Carole Playford, it was very dusty and it had no plug on the two core mains cable. 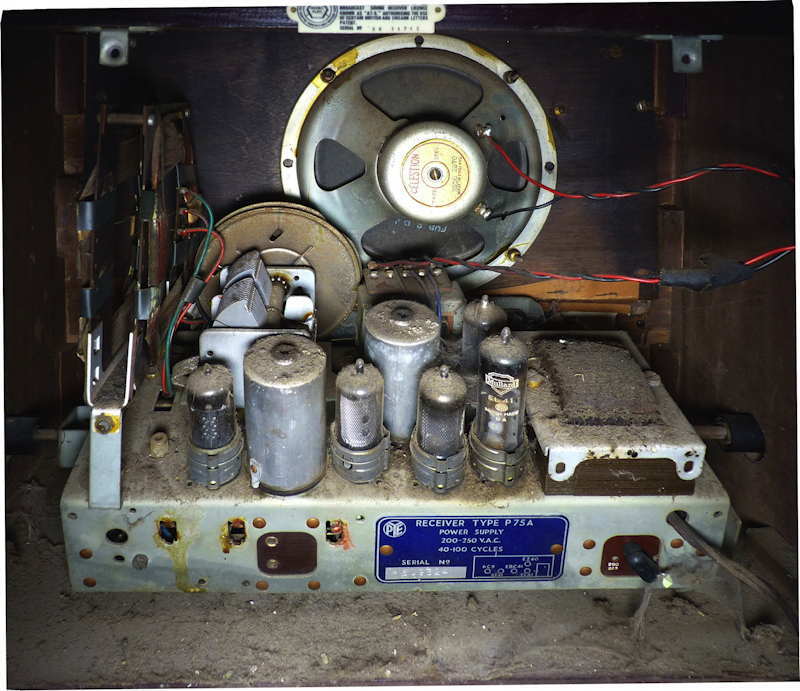 I removed the back and connected it to my variable transformer in series with an Avometer to monitor the current and gradually, very slowly, increased the voltage with one hand on the switch. With the volume control on maximum I heard sounds from the speaker and it was possible to hear stations on all three wavebands. This all looked very promising so I removed the chassis (with some difficult since the knobs were extremely hard to remove) and blew out much of the dust with compressed air and a soft paint brush. Someone previously had cut the speaker wires and rejoined them, presumably to effect a repair though I could see no evidence. Possibly the only thing that had been changed was a pilot light (though both were now dead) as it is impossible to reach one because access is hindered by the frame aerial. The valves were removed cleaned and the holders given a dose of switch cleaner as was the wave change switch. To be able to work on the underside of the chassis the set was mounted on a couple of wooded supports (see picture below). I have a very useful DVD from Paul Stenning (https://www.vintage-radio.com) from which I printed off a copy of the service sheet. After photographing the underside I proceeded to test the individual capacitors and replace them one by one. 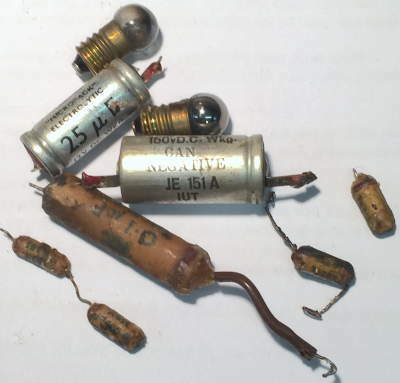 When tested with a megger the wax coated ones were all found to have resistances in the order of a few thousand ohms. One of the low voltage electrolytics had leaked so this and the other were replaced as well. Yo will see that I Have used capacitors from a variety of sources several of which have been salvaged from much more modern equipment. A three core lead with moulded plug and cable clamp from a discarded table lamp was used to replace the original two core one. My test speaker equipped with curly wire and crocodile clips was attached to the set and Eureka on switching on all went well even two stations on short wave without an aerial being attached. 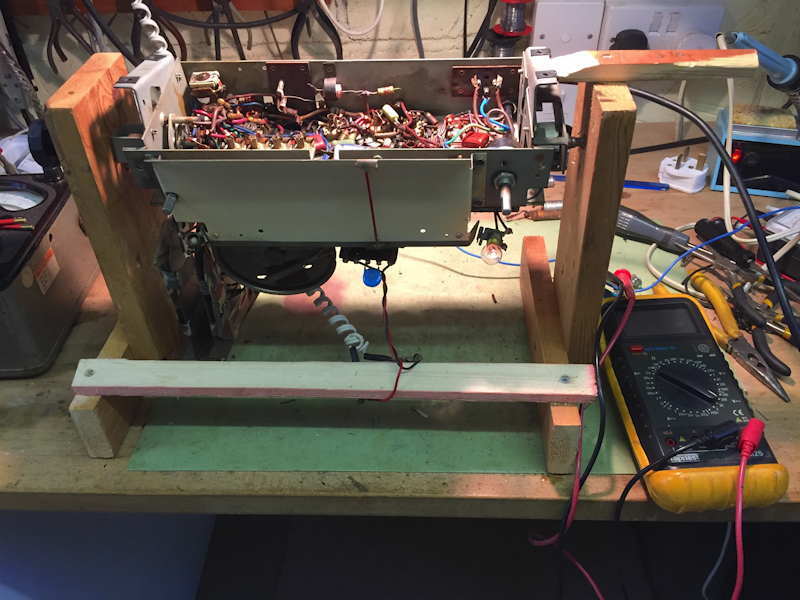 The wooden case needed a little attention as the two light coloured strips either side of the speaker grille needed gluing. A wash and polish was all that was really needed to make it presentable. What is it worth today? for a working radio in good condition you might reasonably expect to get between £ 20 and £ 35.